I’ve got 640 miles on my 2019 AWD Fsport. So far I’m averaging 20mpg. I’d say I drive 70% highway and 30% city. City being suburban side streets. I drive mostly in normal mode and occasionally in Sport+. I’d say I’m an average driver. Occasionally I’ll punch it but not very often. Coming from an AWD G37 with a 3.7L v6 and 330HP averaging 22mpg. Hopefully my MPG will at least match the G37. I suppose the NX still needs to break in? 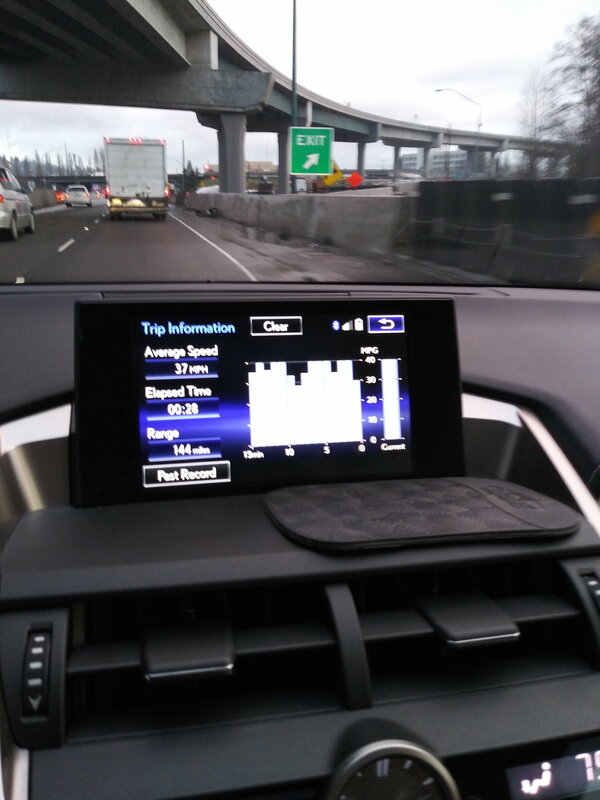 I've had my NX300 AWD F-sport for about 3.5 months and have almost 3k on it and I recently started getting about 23 mpg with same 70/30 city/highway commute. I came from an 2016 IS350 and was averaging 20 this time of the year with the same commute. I think your mpg will get better as the miles rack up. But I drive in ECO almost all the time which is fine for living in NYC. Yes me too, sport mode is nice (no AVS so no sport+ for me). Try a tank in ECO over the same route and you should see an improvement in MPG but be ready for dull acceleration. Can you tell me if the car will consume more with rims on 20. If so, how much more? Thanks! Is the 245/45 / R20 good for that? What year NX and what is the size tire you have right now? Tire Rack only recommends 235/45/R20. Keep in mind that the lower profile tire will give a stiffer (bumpier) ride. Yes I know this. I have 18 wheels on the Audi A6 2010 in combination with the factory sports suspension. It would not be a problem, just because I like the look of the tank when it has the higher ball. I'm not sure I want to change her appearance to a totally sporting one. And the rims are even more protected when the tire is taller. I had problems with the rims on Audi. One pic worth thousand words. Morning commute from Lake Holm WA to Seattle. Very mild traffic. Not sure how folks get 23-24 mpg... I stay within 5+ speed limit, which is 60mph around here. But such commute does not really go faster than 50-55. I’m getting 21mpg with an AWD F-Sport. Mostly highway. This is my first post here, I am in the market to buy a car and looking for a used NX 300. I have seen one 18' NX 300 AWD which I really like but very concerned about the fuel economy, Also concerned that it may require more maintenance than the regular FWD. Me and my wife like the color and the packages its coming with very much beat other deals we are seeing here. We live in South and we never get snow and the roads are pretty good so FWD will be fine but the price for this(AWD) beats the fwd in color and features. I will be driving this car 80% of time in the city and during peak time traffic. Appreciate any input from AWD owners. what was your experience with brakes and fuel economy. The AWD on the NX only engages when the front wheels slip. It will be FWD the majority of the time. That said, the AWD system does add some weight. I don’t think maintenance is a concern though. Thanks, that said, I did find a deal on 300h AWD. The color is not the best what we were looking for but I think 300h suites well me and my wife here in the south concerning the traffic.